For the last 40 – 50 years careers paths worked like an escalator. You started at the bottom and slowly worked your way up to the top of that ladder. You went to college, got a job, and didn’t leave until you made it to the top. While I was in college, 2006 – 2011, the escalator broke. Those at the top of the escalator could not jump off. The housing crash wiped them out. Many of my friends struggled to find jobs after graduation because of this. We need to think about work & career growth in a different way. 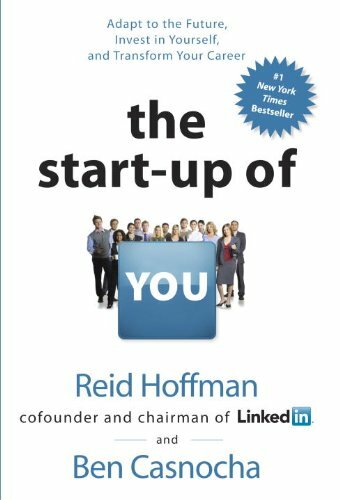 Today I wanted to talk about the book “The Start-up of You” by Reid Hoffman & Ben Casnocha ,which stresses that we need to take control of our career and start treating it like we are running a startup. Finished reading the book not to long ago. You have to treat your career like a startup. The similarities between the two are striking. Think about the market and industry around you find out how you’re different. Your competitive advantage is the intersection between. Your aspirations, your assets, and market realities. Reid & Ben introduce a concept that I really liked called ABZ planning. Plan A is your current path. It’s whats working right now. Plan B is the pivot or the change you make when Plan A no longer cuts it. Plan Z is the baseline, your fallback. It’s the net that catches you if all else fails. There is no beginning, middle, or end to a career journey; no matter how old you are or at what stage, you will always be planning and adapting. It’s important to grow and maintain the network that you have. The key is focusing on helping others. Today even search literacy is not enough. The bigger advantage is gained by network literacy: knowing how to conceptualize, access, and benefit from the information flowing through your social network. Without risk there is little reward, but at the same time you want to be smart about the risks that you take. Pursue opportunities that have lower risk than your peers think, but that are still higher reward. In the short run, low volatility means stability. In the long run, though, low volatility leads to increased vulnerability, because it renders the system less resilient to unthinkable external shocks. With a strong network you’re able to get a lot more done. You do this by reaching out to them for questions and help. Successful people harness the powers of their networks to get more done in less time. They can do this by acquiring filtered knowledge. …there are two basic ways to tap information from your network: (1) ask targeted questions to specific individuals in your network, and/or (2) cast the net more widely by querying a broad swath of your network all at once. The world of tomorrow will be more like the Silicon Valley of today: constant change. This is money that you set aside to meet with interesting people. This helps you be ready for opportunities when they come, because you don’t have to worry about where the money will come from. It’s budgeting in the money to learn and grow. You’re never finished with your career. There’s always something to learn; there’s always work to be done. You should always be experimenting. Winning careers, like winning start-ups, are in permanent beta: always a work in progress. The book is an absolute must-read and I highly recommended it regardless of what industry you work in or how old you are. Still not convinced? Maybe the book trailer will win you over.